I Just bought the Dell - XPS 15.6" 4K Ultra HD Touch-Screen Laptop - Intel Core i7 - 16GB Memory - NVIDIA GeForce GTX 1050 - 512GB SSD - Silver (9560) and i was wondering how would i upgrade the ssd to 1 or 2 tb and the ram from 16 to 32 using the ram provided by Crucial(microcon or samsung) and what ssd would be the best i was thinking that a samsung ssd would do the job what one is the best for the 9560 and where is the best place to the ssd from is amazon ok or can you recommend a better place to buy the things i need for this upgrade. I have a very similar question. I have an XPS15 9550 touch screen with two drives. one is a 32GB SSD and the other is a 1TB Hard Drive. I want to upgrade the hard drive to an SSD and want to know which drive to buy. 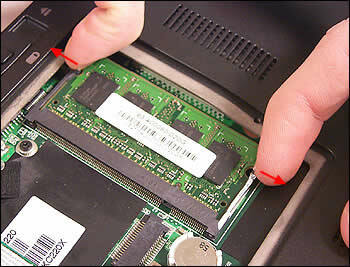 Here is a video on how to remove the bottom plate so that you may access the ram and SSD. You'll notice the ssd is m.2 form factor and not 2.5" sata and is upgradable, the above video shows the process. The ram can also be upgraded easily while your in there, there are just two little metal clips that must be pulled apart, this image demonstrates. When it comes to what SSD to buy and where to buy it, it's completely down to how much money you want to spend, if you want a very good m.2 SSD, the Samsung pro is a good pick (I use a Samsung SSD 850 PRO 256GB myself). Buying advice: pick the SSD you want (agree with it's general price) and shop around for a bargain. Ram, again, is down to how much do you want spend. If you want 32gbs you will need to buy 2x16gb sticks. The type of ram is "DDR4 PC4-19200 2400MHz 260-pin SODIMM" sounds like a mouth full but if you put "32 gb buy" at the end and google it, you'll get quite a few results to consider. It looks like there is a caddy for a 2.5 inch drive as well as the m.2 form factor... Can I have both? The m.2 for my work and the 2.5 for my storage and backups? Since the HDD is 2.5 inch, could you swap that for a 2.5 inch SSD? I'm assuming you have the M.2 version of a ssd and not the sata 3 version. Go for the 960 Pro from Samsung and if that is too expensive, Crucial makes some afforable m.2 drives. For ram, Crucial has its ranging from 4GB to 32GB so pick any from their lineup, just make sure it's DDR4 and having a higher DRAM clock rate like 2400 or higher doesn't hurt. Grabbing thermal compound like the Noctua nth1 is great for this system. Artic Silver 5 is getting old and Noctua makes a better paste. you can also grab better thermal pads and altogether, it's going to be less than $20. Don't forget to undervolt your cpu since it's being fed too much voltage anyways. Undervolting can lower heat, cause the fans to spin less often and slower so it's not as loud and it'll prolong the lifespan of your computer. How do you undervolt, is that in the BIOS or is it a software download? Alistair W Morris será eternamente grato(a).